The Cape Town skyline is even more majestic when experienced at sunset. Step on board a sleek and modern ship that takes you out on the open water, and watch the sunset over the ocean and the Mother City, as Cape Town is bathed in a golden stream of light so powerful that it’s blinding. Take in the moment when the city comes alive with lights that are so glittering that you’ll have a tough time distinguishing the skyline from the night sky. A cruise out into the sunset is filled with opportunities. As we bid farewell to the day and embrace the night, a new side of Cape Town awakens with fashionable eateries and cosmopolitan venues that embrace weary locals and tourists in search of reprieve from the hustle and bustle of daytime city life. 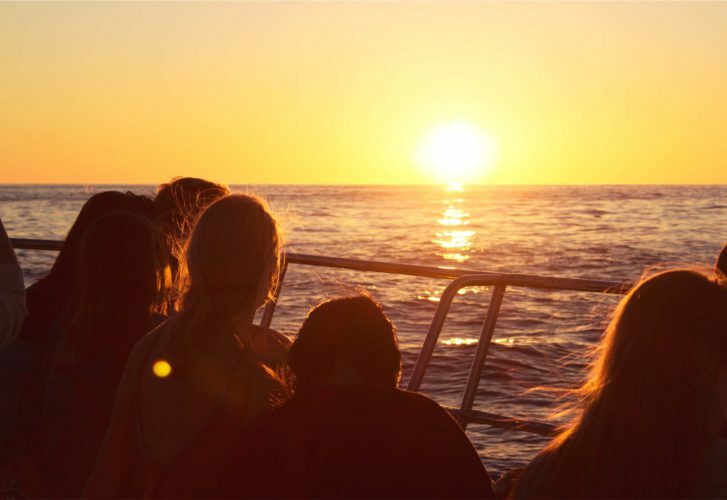 Why choose us for a sunset cruise in Cape Town, when there are so many other cruise companies vying for your attention? Our TIGGER 2 Royale is a 55-foot luxury power catamaran powered by two 530 HP inboard turbo charged diesel engines. But if those technical details mean nothing to you, maybe the fact that we’re able to hit a cruising speed of 12-16 knots might appeal to you. She’s currently the flagship of the charter industry, and you can enjoy her beautifully streamlined and plush white leather interior. Let us help you experience Cape Town like never before. Our catamaran is able to cater to a maximum of 65 guests. We cater for individuals, corporations and special functions and provide, without a doubt, the best cruising option for any discerning client. The sunset cruise is by far our most popular choice for cruising with the TIGGER 2 Royale. This cruise takes you straight to Clifton 4th Beach or, weather permitting, to Table Bay. Once we reach the destination, you enjoy and take in the scenic view, while also sipping on a glass of Méthode Cap Classique sparkling wine. We make our return and slowly cruise back as the sun sets and the city lights up, a first-class experience with Table Mountain and the 12 Apostles as an exquisite backdrop. It’s most definitely the cruise of choice for any romantic at heart. Look forward to a 90-minute cruise on a beautiful and modern catamaran ready to help you experience the other side of Cape Town. On a private basis, we also offer sunset cruises for up to 65 people. What About a Lunch or Dinner Cruise? If you are in search of a unique venue for your special occasion, then you’ve found it. You’re welcome to join us for lunch or dinner on board our beautiful catamaran, and treat yourself to the experience of a lifetime with our celebrated lunch and dinner cruises. We offer a choice of duration, with eclectic menu options catering to all tastes. The lunch cruise is a scenic cruise departing from the Victoria & Albert Waterfront, where our passengers are able to bask in the stunning views of Lions Head, Table Mountain and Signal Hill, as we slowly cruise along the coastline. We either drop anchor in front of Clifton 4th Beach or Granger Bay. If the weather and ocean conditions aren’t playing along, we return to the mooring at the V&A Marina, where you get to relax and indulge in the luncheon menu of your choice. The dinner cruise also departs from the V&A Waterfront, where you get to enjoy the beautiful views of Table Mountain. Admire the spectacular Cape Town sunset, as you enjoy your delicious dinner menu. These are only a few of the many experiences you can look forward to when joining us for any one of our cruise packages, and we look forward to welcoming you and your party to the TIGGER 2 Royale. If you’ve always wanted to dine on board a ship, or experience a beautiful cruise sunset, now is the time. We are ready to help you bring your dreams to life, and to provide you with an experience that will stay with you forever. Contact us to learn more about our cruise packages, and for all the information needed to make an informed decision regarding when to book your sunset cruise.